You can shape the High Desert’s future through a legacy or “planned” gift to the High Desert Museum. A gift from your estate, large or small, can have a great impact on the Museum. From caring for wildlife, to funding children’s programs or creating an exhibit, your gift will make a difference! In addition, a charitable gift may save your family money by decreasing estate taxes. And- it’s easy to do. A simple directive in your will or trust will support the Museum in continuing to offer its unique educational programs and compelling exhibitions. Other types of legacy giving can help create an income stream to you from an appreciated asset or lower your income taxes. One of the most powerful reasons people launch endowments is to create lasting legacies. These ongoing funds provide perpetual support for the Museum, and also remind family and friends of your values and commitments. Endowment gifts can be made to support Museum operations, or for its programs, exhibits or wildlife. Help ensure that the natural and cultural resources of the High Desert will endure and be enjoyed by others. Your gift, and the lives it touches, can be your legacy. To take the first step, talk with Heather Vihstadt at (541) 382-4754 ext. 248 or contact us. She will be glad to assist you in the process or answer any questions. View the Bequest Intention Form here. Donors who commit to a legacy gift are honored with a membership in the Museum’s Robert W. Chandler Society. Learn more about Robert W. Chandler and the Society here. 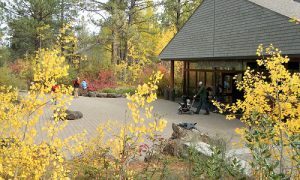 The High Desert Museum is a qualified 501(3)c non-profit. All donations are tax-deductible as allowed by law.